Verizon may brag — a little too much — about its customer satisfaction stats, but what do those numbers mean when the company won’t build out its network to reach new customers? Are you like a lot of people in this country — You want to change your broadband provider but you can’t because the only high-speed option in your town is your cable company? Maybe you’ve been holding out hope that Verizon will bring FiOS to your town so that you’ll at least have something that resembles a choice. We’ve got bad news for you, the company says it’s getting to the end of its current plans to build out the FiOS network. This is according to Verizon Chief Financial Officer Fran “Whammo” Shammo (who recently declared that the company will not get into that rollover data trend that’s all popular with kids today). Speaking to investors last week, the Great Shammo made clear the company’s plans to invest its money in its wireless business. This doesn’t mean that Verizon is abandoning FiOS; just that you probably won’t be getting access to it in your town if you don’t already have it. FiOS brought in $3.3 billion to Verizon last year, an increase of 11.6%, and now accounts for 77% of the company’s wireline revenue. And it will likely continue to bring in more money and, more importantly, make more of a profit because Verizon won’t be spending money to build out its network. Shammo’s comments did not go over well with the people of New Jersey who maintain that Verizon has bailed on a 22-year-old agreement with the state to build out broadband digital service to 100% of the Garden State. 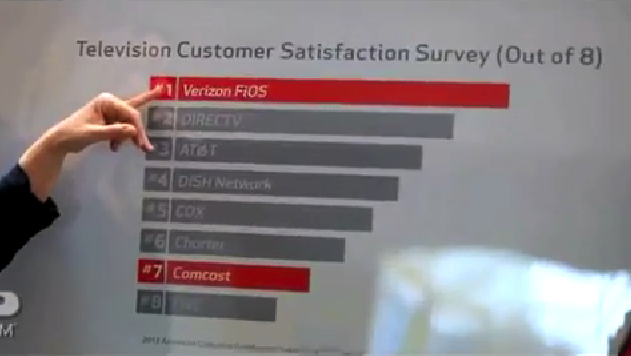 Even though FiOS is sometimes viewed as a national competitor to the likes of Comcast, Charter, Time Warner Cable, who have near-monopoly control on high-speed broadband in most of the areas in which they operate, it currently only has 6.6 million broadband customers and 5.6 million pay-TV subscribers, significantly fewer than those other major ISPs. The FiOS network itself only reaches a total of 19.8 million premises, which means there is a lot of room for the company to acquire new customers, but also means that even if it signed up every possible person to FiOS, it would still be smaller than Comcast. UPDATE: A rep for Verizon tells Consumerist that the original plan for FiOS was to build out the network beyond 18 million premises, which as we noted above they have by 1.8 million. The rep claims that it was this goal that Mr. Shammo was referencing in his recent comments. “That number by the way continues to creep upward as we build out metropolitan areas like New York city, Washington, D.C., Pittsburgh and Philadelphia plus a few other smaller cities,” adds the rep.